Earn 7.5 SB per $ when you buy Zappos.com gift cards at MyGiftCardsPlus, powered by Swagbucks. If the shoe fits, wear it. If not, Zappos.com will gladly take it back at no cost to you. Zappos.com has become the #1 seller of shoes online (ahead of J.C. Penney) by stressing customer service. It stocks 3 million pairs of shoes, handbags, and apparel and accessories, specializing in some 1,000 brands that are difficult to find in mainstream shopping malls. 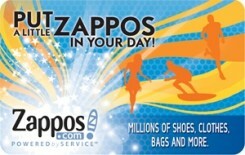 • The Zappos.com Gift Card can only be used online at Zappos.com. • They cannot be redeemed in Zappos.com retail stores. • Gift Cards will not be returnable or exchangeable for cash, except in states where required by law. • Purchase amounts that exceed the value of the tendered Gift Card or e-Gift Certificate will require a credit card for the balance due.